Two blog posts in one day? Who am I? Well, I’m about to go out of town, and I wanted to get all of these thoughts out my mind and before I forget them. My friend from work called me to tell me, “I hate you”, after reading my post this morning. I love her honesty, but it made me think that I should probably explain, okay, there was a time that I ran 89 miles per week and 5ks in 16 minutes… so running 89 miles in a month and a 5k in 21 minutes may seem excessive, but TRUST ME it’s not. My doctor and I have had many long conversations about all of this and she is 100% okay with my level of exercise. The other hot topic at the moment is weight gain. I’ve mentioned before that I was worried about gaining weight and seeing all-time high numbers on the scale, but in truth I’m completely okay with this temporary side effect of creating a human being. Although my weight gain has slowed a little, it’s not something that’s happening on purpose. A random person that I work with (who I have spoken a total of ten words to in four years) commented today that I didn’t look like I was in my third trimester. Well, what the hell is that supposed to mean? I’ve gained almost 20 pounds so far, but I guess she was upset that I don’t look like a giant hippo yet. So, I dug up a photo I took in the bathroom mirror in mid-February before we started to do official photos every week. I know I look hot here, try to contain yourself. This was probably at 10 or 11 weeks. And this one was from this past weekend. Clearly you can see that I’m gaining a healthy amount of weight. Try to ignore the slight sunburn from the beach (belly hasn’t seen much daylight). That was my 27 week photo. I’ve been a little tired lately, but other than that I feel pretty darn good. This weekend is my baby shower in New York, and a few hours before that I’ll be running one of my favorite races, the OK 5k (along with my husband, sister, brother-in-law, and 21-month old niece). After that we only have a week of school left! Pete are I are also headed to Maine in a few weeks to celebrate our fourth wedding anniversary, and I guess you could call that our babymoon, whatever the hell that is. I find it annoying when I hear people talk about being pregnant as if they are the only person in the history of the WORLD to be pregnant, so I digress. Also, I know I’m not normal, and the title of this post is intended to be taken lightly as is everything else I write. What’s your favorite race? Do you have any fun vacation plans for the summer? Any ideas of what we should do in Maine? YOU ARE RUNNING THE OK 5K??! Sorry my excitement got the best of me. I’ll see you there. ha ha. I think you look great and I can’t even imagine how hard it is for hear those sorts of comments. Every one gains weight for pregnancy at different rates and levels. 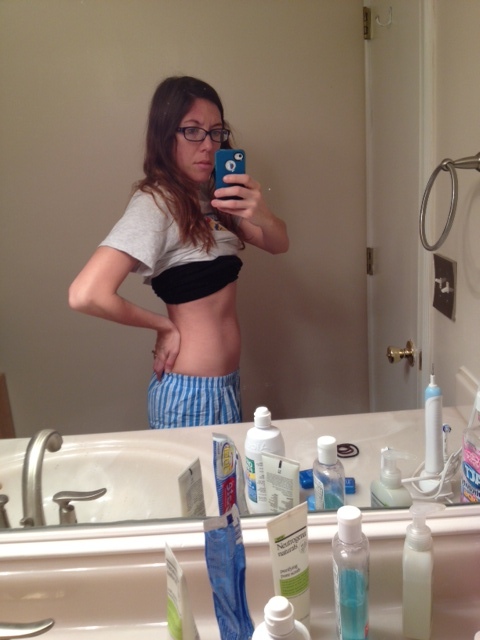 (A friend I’e had has looked like she is in her 3rd trimester for at least half of hers). I honestly think commenting on peoples bodys regardless of pregnancy is rude to begin with. Haha, I’m running the REAL ORIGINAL OK 5k in Kinderhook, NY. That’s what us OG’s do. I think it’s weird that there is another race by the same name on the same date. You can tell them how unoriginal they are when you are accepting your award, k? I’ve gotten used to the comments, but I thought this one was particularly funny because this lady like never talks to me and now all of a sudden has to comment on my weight. Whatever. Well, good luck with your race this weekend! Mollie,I have two weeks to go and have only gained 21 lbs and that’s how much I gained with the last 2. I don’t run as fast as you by any means but run 30 miles a week. I did this with my past pregnancys as well. It’s a testament to how in shape you were. Most people call it quits when they get pregnant. I learned to keep to myself during pregnancy because most people have more negative than positive things to say!!! Mollie, by the time the end of pregnancy comes you don’t care, you just want baby out! I am not a all natural girl so I personally recommend a epidural! It takes all the pain away!!:). It’s also not scary pain!!! I was competing with my sister who could push baby out the fastest!! She won with under 10 min, I was 13 min….I look at that as a challenge and I am sure you will too! Being in shape helps!!! It’s a choice, do I want to do 1 800 or repeats?!! I walked stadium stairs through my second trimester and ran up until 8 months (confession, not nearly as far or fast as you). 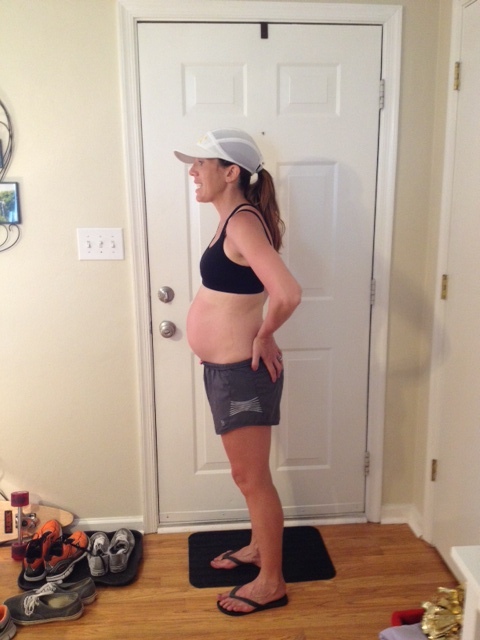 I did not complain of back pain, I had a fast labor, and lost all the baby weight by 12 weeks post partum. Haters gonna hate. Enjoy these last few months! That’s fantastic Tracy (and most of my runs are not that fast, partly because I have to pee the entire time). I’m hoping for a fast labor, or at least an uncomplicated one would be nice. Fear of the unknown!